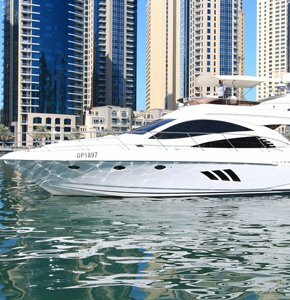 Jumeirah Yachts is a fresh and dynamic Yacht Charter Company in Dubai, United Arab Emirates, established to add on to service, value and professionalism to the leisure marine industry in the UAE offering Luxury, Comfort, High performance and Adventure. Our skilled and highly passionate team will be pleased to welcome you on board, committed to create a safe, friendly, hospitable and positive atmosphere. Our luxurious yachts integrate the latest safety and navigation equipment according to the UAE Coast Guard requirements. Choose your luxury Benetti 35 in Dubai and book it with Super Yachts Rental Dubai, the leading Yacht Charter Company in Dubai. Request a quote online. The real Diamond in our fleet! Blessed with a superb sea-handling capability,the graceful Majesty 101 with its trend-setting styling and luxurious interiors is a yacht for the seriously sophisticated. From the fly-bridge with bar and barbecue, to the saloon with its full length panoramic windows and large curved centre-opening sliding door giving access to the … Continue reading "Majesty 101"
Blessed with a superb sea-handling capability, the graceful Majesty 88 with its trend-setting styling and luxurious interiors is a yacht for the seriously sophisticated. From the fly-bridge with its wrap-around seating, bar and barbecue, to the saloon with its full length panoramic windows and large curved centre-opening sliding door giving access to the aft deck, … Continue reading "Majesty 88"
The 85ft Duretti combines luxury with comfort in a stylish yacht with excellent amenities such as a flybridge, Jacuzzi, BBQ, and a great Sound System. Whether for relaxing on deck, or enjoying the water from the swim platform at the rear, this yacht is an excellent choice for a day of coastal cruising. One of the biggest in the family. Catering to 30 people the Majesty 75 serves you well with bedrooms,kitchen.hall and a huge deck to rest under the sun. For more convenience, a fully equipped kitchen. To enjoy the astonishing view, the front sun desk is humongous. You can also stay connected via our Satellite. To … Continue reading "MAJESTY 75"
75 Foot Yacht with a capacity to accommodate 30 guests and having 4 cabins on board. At a full 70 feet, this luxurious yacht boasts powerful inbound engines and enough space to serve up to 25 guests. You and your party have full access to the yachts four beautifully decorated bedrooms, one master bedroom and three additional bedrooms with a twin bed in each. The cabin also holds two restrooms, a … Continue reading "AS 70"
EQUIPMENT Engines: 2 x 1400 hp Baudouin-BTV 12 Cruising speed: 17 knots Fuel consumption: 24981 (L) – 6599(G) ACCOMMODATION Number of cabins: 4, Cabin configuration: 1 Master, 1 VIP, 2 Twin, Bed configuration: 1 King, 1 Double, 2 Twin & Number of overnight guests: 8 SPORTS Tenders + toys: Jet Ski, banana ride, donut ride … Continue reading "KV 100"
The best yacht trip I've had in the years! I want to thank Jumeirah Yachts for their amazing service. Overall, my friends and I are the best time ever! We rented a yacht out for the day and had so much fun. I would definitely recommend this to everyone. A perfect way to spend the day. I loved the service and the yachts trip was really impressive. Thank you Jumeirah Yachts. Jumeirah Yachts is a thrilling and energetic Yacht Charter Company in Dubai that aims to provide you with innovative and dynamic yacht rental services. Equipped with vibrantly luxurious yachts, our yachts charter company will pamper you with its warm, sociable, and positive ambiance, and treat you to nothing but royalty. Our extremely experienced and skilled employees will ensure that you fully enjoy the beauty and tranquil of the deep blue waters and the truly exhilarating adventures of a cruise. Paying high regard to taking the highest standards of safety measures, as outlined by the UAE Coast Guard requirements, our yachts have been outfitted with the most cutting-edge safety and navigation equipment to present you a reassuring journey. 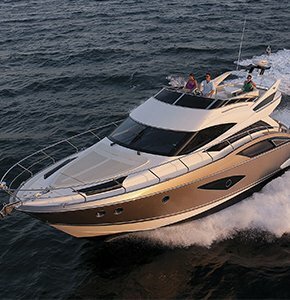 Our company caters an assortment of yachts which are available for you to indulge in, each unique with its own deluxe services and comforts, which has truly assisted in elevating the leisure marine industry in the UAE. make your dreams a reality! We are committed to bringing fresh creative concepts, and delivering the very best, even under pressure within short deadlines. Our boats will leave you relaxed and refreshed, as you will be provided with fresh towels and an array of complimentar refreshments and snacks to keep you energetic and satisfied! Our complimentary fishing equipment is perfect for you, if you’re looking to improve your fishing skills or indulge in your leisure habits, while on deck. 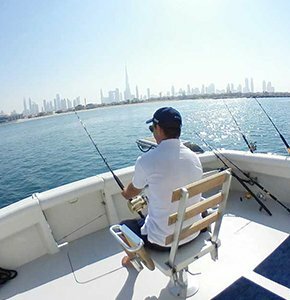 You could embrace the breathtaking sceneries while at sea of several exceptionally wonderful landmarks, which consist of beaches and islands such as the Burj Al Arab, Dubai New Canal, Atlantis – The Palm, The World Islands, Jumeirah Beach, Dubai Creek, Dubai Marina Lagoon, Hamdan Island and many more. To comply with UAE Coast Guard regulations, all passengers must carry proof of identity (Passport or UAE ID) for inspection prior to departure.